Can anybody identify this “tool”? This looks not unlike a similar guage we had for checking the angle we used to file onto the edges of the aluminium base plates that then were clipped to the honeycombe base . Ours however were not as gadget like and certainly were not marked with makers name etc. 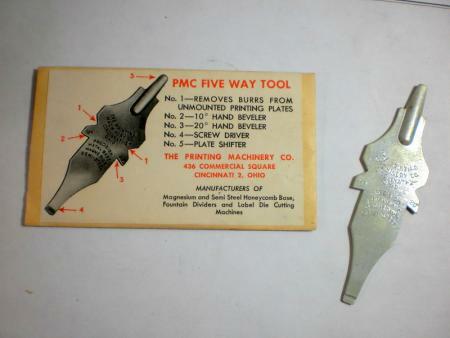 PMC made both Sterling honeycomb base and Warnock grooved base, which used different bevel angles. The conical tip may be a plate shifter, the other end could be for cleaning? Reasonable guess the chisel like end for lifting dst adhered print dies? No one ever said you were reasonable Peter, i think you are right, i guess my idea about it being a tool for opening beer bottles wasn’t right. I wonder how you would manage to open a bottle with it when you can just brace the bottle cap on the lip of the stone and give the top a punt with the heel of your hand! Not from personal practise i must add but i have seen it done! As long as this is in the hand when opening the bottle it could be considered a helper. I saved this image from an ebay listing because I didn’t know how to use this guage either.